For this workout will be needed the interval timer, kettlebell, pair of dumbbell and barbell. Set your interval timer 50 sec work, 10 sec rest between 10 to 20 rounds. The weight and rounds depends of your fitness level. Step1: Begin in a standing position. Your feet should be shoulder-width apart. Now, lower your body into a squatting position, placing your hands on the floor in front of you. Step2: Kick your feet back so that you are in push-up position and lower your chest to do a push-up. Step3: Kick your feet back to their original position. Stand up, and then jump high as you can. Step1: Lie on the floor with a kettlebell in your right hand and your right knee bent. Press it over your face. The arm is straight all the time. 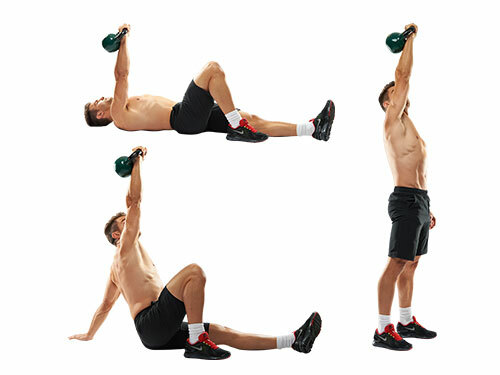 Step2: Press your left forearm into the ground, raise your torso, and explosively push the kettlebell up overhead. Keep your core tight. Step3: Raise up to a full sit, swing your left leg back, and push up further so that you’re propped up on your left shin and right foot and stand up with shoulder-width apart. Step4: Slowly reverse the movement until you’re flat on the floor and switch the arm. Step1: Holding a weight in front of your chest, take a large step forward and bend both knees to about 90 degrees with your back knee just above the floor. Step2: As you do this, twist your upper body to the same side as your front leg, bringing the weight toward your hip. This is your starting position. Step3: From here, jump up high, switching your legs to land in the same position but on the opposite side. Repeat, alternating sides with each rep.
Step1: Lie flat on the floor with the lower back pressed into the ground and arms extended behind your ears. Step2: In one movement lift the legs up keeping them straight and raise the upper body of the floor reaching for the toes with your hands. Step3: Engage and squeeze the abdominal muscles as you reach for your toes. Step4: Slowly lower the body back down to the starting position.